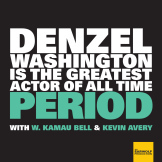 The man behind Welcome to Denzelishness, Igor Rusinov joins Kamau & Kevin all the way from Russia on a special episode of Denzel Washington Is The Greatest Actor of All Time Period! They’ll get into what lead to him creating the Welcome to Denzelishness website (http://rusinov.me/projects/denzelishness/), what life is like is in Saint Petersburg, and his very strange Top 5 Denzel movie choices. Plus, Kevin & Kamau talk about Denzel’s Penn-State and Dillard commencement speeches and share a couple of Denzel Halloween costume ideas.